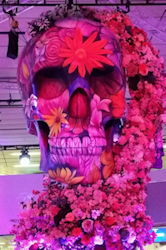 The stunning flower-and-skull display that formed the centerpiece of ECR 2017 certainly looked impressive in everybody's photos, on social media, and in the daily newspaper. But what were the truly lasting impressions and meaningful issues to take away from this year's congress in Vienna? Our editorial team has put together a list of five key themes. 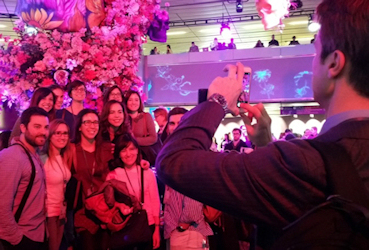 The theme of ECR 2017 was the Flower Gardens of Radiology. Concerns over the safety of gadolinium-based contrast agents (GBCAs) in the brain have not gone away -- in fact they've grown over the past year, and a looming crisis may face the global imaging community as research grows. A vital four-day meeting of the European Medicines Agency (EMA) takes place this week in London. The Pharmacovigilance Risk Assessment Committee (PRAC), which is responsible for assessing risk management of medicines for human use, is finalizing its in-depth investigation into GBCAs. The U.S. Food and Drug Administration (FDA) also is following the issue. The issues are complex and technical, and there's a lot of misinformation around, as Dr. Val Runge, professor of radiology at Inselspital at the University of Bern in Switzerland, explained at a special focus session on Friday. 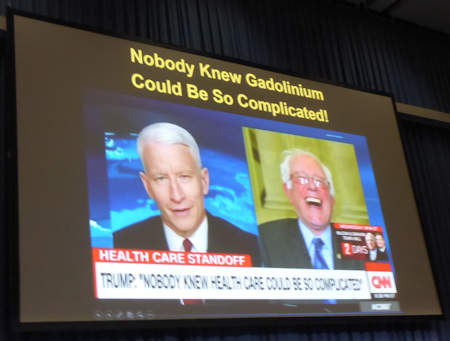 Just as Donald Trump is realizing with healthcare reform, nothing is straightforward in the world gadolinium, warned Dr. Val Runge. "An unstated question which is critical to the analysis of the GBCA data, specifically for each of the linear agents, is whether there are patient populations or indications for which there are no suitable alternatives -- clearly there are alternatives to almost all of the linear agents," he said. "The end result in terms of the actions by the regulatory authorities, and specifically the FDA and EMA, is likely to be based upon a combination of science and politics." Putting on a brave face: Delays at the EMA meant Dr. Olivier Clément, PhD, from Paris had very little to say. Everybody hoped the EMA's investigation, launched in March 2016, would have been wrapped before ECR 2017, but it wasn't. 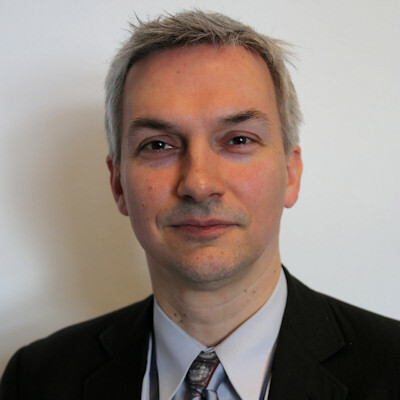 This was particularly frustrating for Dr. Olivier Clément, PhD, head of the Research Committee of the European Society of Radiology (ESR), who had the unenviable task of giving the key ECR lecture about gadolinium safety. Given the delays at the EMA, all Clément could do was to repeat the warnings for populations at risk (children, chronic disease) and cite two as yet unanswered questions: Restriction of indication in certain patient groups? Withdrawal of linear chelates? Gadolinium phobia looks certain to be with us for a good while longer, noted Runge's colleague, Dr. Johannes Heverhagen, PhD, in one of our 11 video interviews from ECR 2017. Radiologists won't be replaced by computers anytime soon, but machine intelligence is sure to have a substantial impact on their practice over the medium term. Applications that will aid radiologists by taking on many of their more repetitive and time-consuming tasks are already on the horizon. 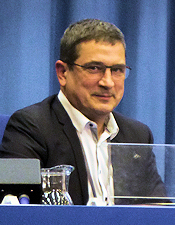 ECR 2017 confirmed that research and development of machine learning are advancing at a dizzying pace, and, not surprisingly, there were many opportunities to learn about the potential role for artificial intelligence (AI), ranging from big-picture discussions at satellite symposia and professional challenges sessions to specific clinical applications discussed in scientific presentations. 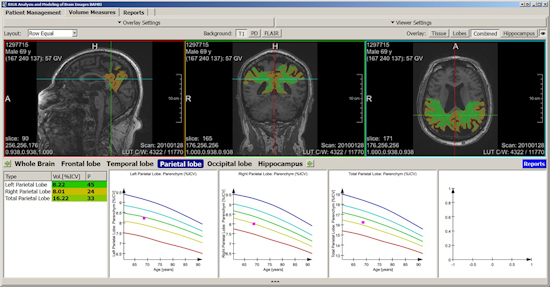 The fully automated segmentation and quantification of different brain regions based on a machine learning algorithm. Software enables the identification of patients at risk of developing dementia long before symptoms of cognitive impairment are apparent. Images courtesy of Dr. Gabriel Krestin, PhD. Originally published in ECR Today 2017. 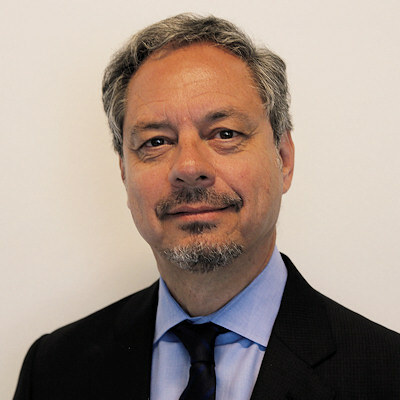 In a professional challenges session, Dr. Gabriel Krestin of Erasmus Medical Center in Rotterdam, the Netherlands, said deep learning may also lead to radiologists transitioning in the future to more of a consulting role with clinicians as part of multidisciplinary teams. Instead of just describing images, radiologists in the future may need to interpret and integrate information from imaging as well as blood tests and genetic sequencing, according to Krestin. On March 1, a dedicated scientific session for machine learning in imaging interpretation discussed how computer-aided detection (CAD) software based on machine learning could produce high negative predictive value and specificity in detecting regions of interest that include breast cancer on MRI studies. Other talks focused using machine learning to predict survival in liver cirrhosis patients undergoing transplantation and also how machine learning can be used to extract meaningful quantitative information from CT images in imaging biobanks. Also, researchers from the University of Zurich, reported that deep learning could interpret mammograms at a level on par with radiologists, while a Spanish team shared how deep learning has the potential to serve as an automated first reader of chest radiographs. 3. DBT debate: Can it replace screening mammography? Digital breast tomosynthesis (DBT) has its legion of fans who cite its ability to increase cancer detection and reduce false-positive rates. So is the technology ready to replace digital mammography for screening? A 63-year-old woman with bilateral breast pain for two months. Both breasts were normal on clinical evaluation. In the outer quadrant of the left breast, a subtle spiculated mass, measuring 16 mm, is seen on craniocaudal view that is not well-visualized on mediolateral oblique view, but it is better demonstrated on tomosynthesis. Courtesy of Dr. Fiona Gilbert, University of Cambridge, U.K. Originally published in ECR Today 2017. "It's the most promising tool we have," said breast imaging pioneer Dr. Sylvia Heywang-Köbrunner of Breast Diagnostics Munich in a symposium dedicated to breast health. DBT's potential can't be denied and its superior sensitivity when compared to digital mammography isn't in doubt, she asserted.But a number of issues need further study, including whether DBT is finding clinically important cancers, the logistics of incorporating the technology into department workflow, and reducing reading time -- which can be two to four times longer than digital mammography. As well, data on DBT's performance with interval cancers is lacking. "Tomosynthesis is the better modality when compared to digital mammography," saidHeywang-Köbrunner. "But is it ready now to replace [2D mammography] for screening? No. We're lacking information, particularly about its interval cancer performance." 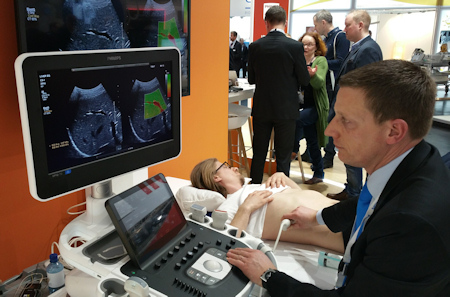 Siemens is showing wide-angle digital breast tomosynthesis on its Mammomat Inspiration system. Research highlighted at the meeting from the Swedish Malmö breast tomosynthesis screening trial underlined the same concerns, although presenter Dr. Kristina Lång, PhD, of Lund University suggested that DBT is more ready than not for screening primetime -- especially with help from artificial intelligence to address the reading time problem. In any case, her team plans to work with researchers from the Screening with Tomosynthesis or Standard Mammography (STORM) trials and the Oslo Tomosynthesis Screening Trial (OTST) to tackle the interval cancer issue. Once that's resolved, screening DBT will be ready to replace digital mammography. 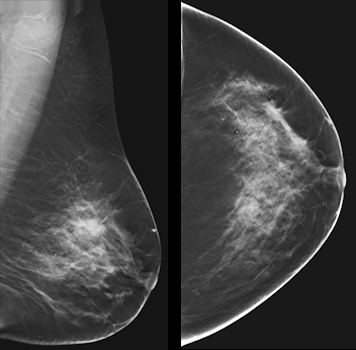 "Breast tomosynthesis increases the cancer detection rate in screening with a reasonable elevation of the recall rate," Lång said. "When interval cancer data has been analyzed, [we'll be able] to use tomosynthesis for screening -- with the aid of artificial intelligence." While the screening question continues to be debated, DBT is proving to be a valuable tool for a variety of other applications, including staging surgical breast cancer treatment, researchers from Turin, Italy, reported. They found that, when used with digital mammography, DBT cut the re-excision rate in women who underwent breast cancer surgery by half compared to those who were staged with digital mammography and ultrasound: from 10% to 5%. A decade ago, topics such as burnout, job dissatisfaction, and gender inequality were very rarely, if ever, covered at serious scientific meetings, including ECR. These challenges existed, of course, but they weren't openly acknowledged, as program organizers thought congresses were not the appropriate forum to address them. After years of radiology's problems being swept under the carpet, they're now being tackled head-on by senior radiologists with great sensitivity and compassion. 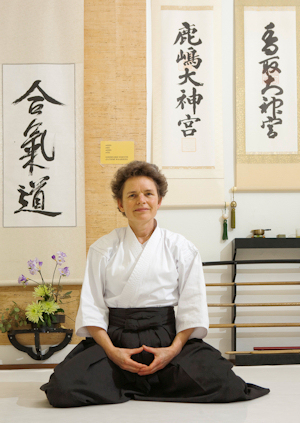 Dr. Myriam Hunink, PhD, meditates in her aikido clothes in the dojo. 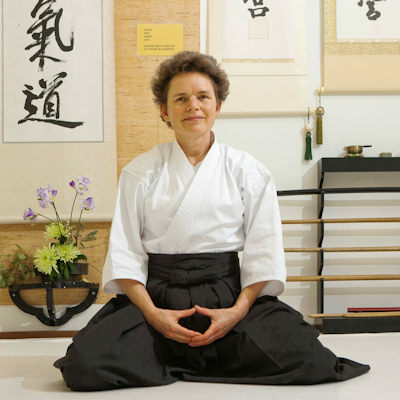 On March 2, ECR 2017 delegates were treated to a fine honorary lecture by Dr. Mauricio Castillo from the University of North Carolina at Chapel Hill in the U.S. And to coincide with professional challenges session on March 11, a photo of Dr. Myriam Hunink, PhD, meditating appeared on the front cover of ECR Today, the congress daily newspaper. In the same story, Dr. Markus Berger, chief of radiology at the Swiss Paraplegic Centre in Nottwil, Switzerland, described in intricate detail how burnout affected him. As Castillo said, all of us are at risk of burnout. Faced by growing workloads and rising stress levels, we need to recognize the signs, find a solution that works for us, and keep aware of its existence. It speaks volumes for radiology that such openness now exists. The skeletons have come out of the cupboard. Doing this has required courage, vision, and tenacity. Such a refreshing approach looks certain to bring positive results for the profession in the years to come. 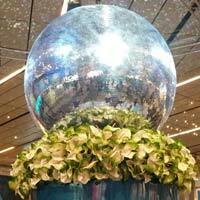 As a showcase for new products, ECR has long labored in the shadow of the annual RSNA meeting. Imaging vendors have tended to reserve their most important product launches for Chicago, leaving only leftovers to be pawed over by congress attendees in Vienna. This situation has been changing in recent years and seemed to take a step forward at ECR 2017. 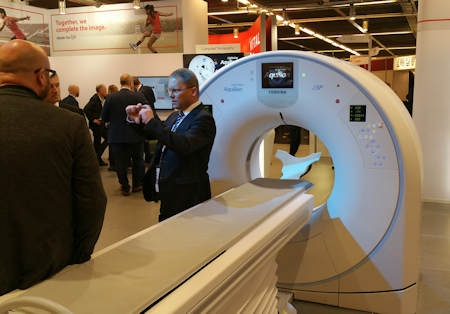 No fewer than three major new global product launches took place at this year's congress, including a new 3-tesla MRI scanner from Siemens Healthineers, a new interventional angiography system from Philips Healthcare, and a new macrocyclic MRI contrast agent from GE Healthcare. 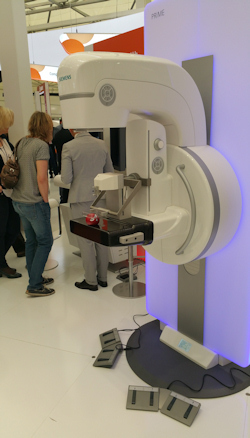 Magnetom Vida is a new 3-tesla MRI scanner. That's to say nothing of numerous other smaller product launches that occurred at ECR 2017. Some of these were European launches of products sold in other geographic regions, such as a new CT scanner launched by Toshiba Medical Systems that's targeted at the economy segment, but there is no question that commercial activity is growing at Austria Center Vienna. What's the reason for ECR's rising prominence? 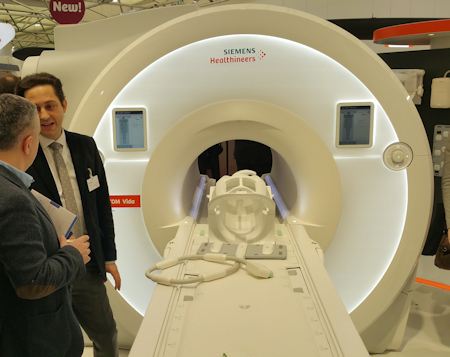 At this stage we can offer only theories, but several reasons could explain why imaging vendors might be shifting in favor of the Vienna congress. First, it could be that RSNA has become a victim of its own success, growing into radiology's version of the Super Bowl (or World Cup, if you prefer) as 54,000 radiology professionals descend on Chicago. Entire marketing budgets and product launch plans revolve around the meeting. The problem with that approach is that it creates a cacophony of noise that can often swallow even the best-laid marketing messages. ElastQ is a new ultrasound mode that supports ultrasound elastography. ECR, on the other hand, offers a more discrete environment, somewhere in the neighborhood of 21,000 attendees. That's less than half the number that typically attends RSNA, but there's also less competition from other companies, giving ECR an edge. Another wild card is changing travel patterns. It's become increasingly problematic for international radiologists to make the trip to the U.S., be it due to economic problems in home countries, currency fluctuations that have seen the value of the U.S. dollar rise, or increasingly strict U.S. immigration and travel laws. A number of RSNA watchers have noted a seeming decline in international attendance at RSNA, and it's a trend that's not gone unnoticed at ESR. In fact, ECR 2017 President Dr. Paul Parizel made a point of noting the meeting's international aspirations in the opening ceremony of this year's congress. "This is a global meeting," he said. Aquilion Lightning SP is a new economy-level CT scanner. And the numbers bear him out. While 50% of ESR's membership is from Europe, 23% are Asian, 16% are South American, 7% are North American, and 3% are African. If you're looking for a truly international audience for your product launch, what better forum than ECR?